Before becoming a Ph.D. student in international relations and a master’s student in Latin American and Caribbean studies, Imdat Oner was an entry-level officer with the Turkish Foreign Service stationed in Caracas, Venezuela. “The day that I learned I had been assigned to Caracas, the news [outlets] were reporting that a former Miss Venezuela had been murdered in a roadside attack,” he recalled. 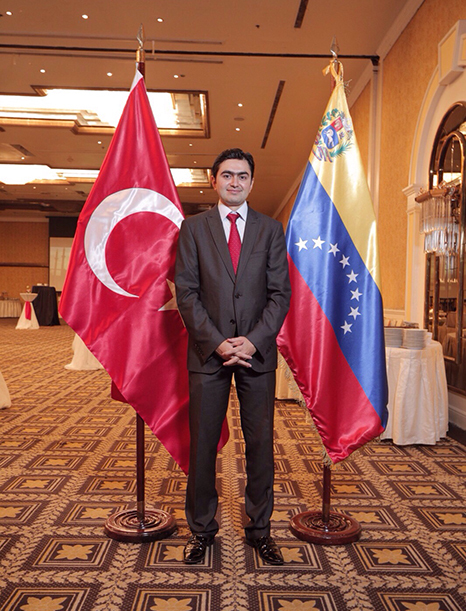 While in Venezuela, Oner was the political officer and deputy head of mission in the Turkish Embassy. After six years as a diplomat, Oner returned to academia and specialized in foreign policy and authoritarianism in Latin America. Imdat Oner while at Caracas in his role as political officer and deputy head of mission in the Turkish Embassy. “After I completed my tenure in Venezuela, I applied for a Ph.D. program in the U.S. to be able to gain a theoretical background on Latin American politics and integrate my field experiences with the theoretical background,” he said. Oner primarily analyzes the intersection of foreign policy and authoritarianism in Venezuela. He is also currently researching the rising authoritarianism, populism and foreign policy of Turkish politics. “I just try to understand the internal and external factors behind Turkey’s recent drift toward Venezuela and interpret from both the angles of a practitioner and scholar,” he said. Oner recently published an op-ed on The Global Americans – a non-profit website that conducts research and analysis on topics about a new global Latin America. His piece, “New breathing room for the Maduro regime: Authoritarian coalition” covers how Turkey has grown as one of Venezuela’s allies in recent years. “The [Venezuelan] regime has intensified its efforts to improve Venezuela’s diplomatic ties outside the hemisphere, particularly with like-minded international actors,” said Oner in his article. In June of this year, Oner’s research was also published in The National Interest – an American bimonthly international affairs magazine that focuses on promoting debate about American foreign policy. In his article, “The challengers facing a would-be coup in Venezuela,” Oner argues that the encouragement of a coup d’état in Venezuela against Maduro is unwise and compared it to the failed coup attempt in Turkey in 2016. “[Turkey’s president] Erdogan used the coup attempt as an excuse to eliminate the opposition and fortify his absolute monopoly over democratic institutions,” he said in the article. According to Oner, a coup d’état from the military official in Venezuela is unlikely because those individuals in high positions have a lot to lose if there is a political transition toward a democracy and the rule of law – and a mid-level position military coup would not be successful. An unsuccessful military uprising would be much like Turkey’s – or worse. Oner said FIU and its Kimberly Green Latin American and Caribbean Center is one of the best places for him to be conducting such research.